With the first 2016 nomination contests at hand, a new survey underscores the extent to which Republicans have come to place less value on a presidential candidate’s prior experience in office – especially experience as a Washington official. Currently, 44% of Republicans and Republican-leaning independents say they would be less likely to support a hypothetical presidential candidate who has been an elected official in Washington, D.C., for many years. Fewer than half as many Republicans (18%) say they would be more likely to support such a candidate, while 37% say extensive Washington experience would not matter. By contrast, just 19% of Democrats and Democratic leaners view lengthy Washington experience as a negative trait for a candidate: 27% say they would be more likely to support such a candidate, and 53% say it would not be a factor. The share of Republicans who say they would be less likely to support a candidate with many years of experience in Washington has more than doubled since 2007 – from 20% to 44% – while showing less change among Democrats (increasing from 12% to 19%). In 2007, only 15% of the public overall said they would be less likely to support a candidate with extensive experience in Washington, while 35% said they would be more likely to do so. About half (45%) said this would not factor into their decision. 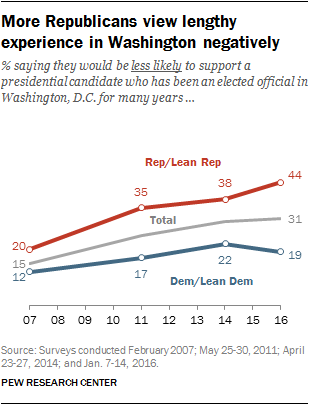 In 2016, roughly twice as many (31%) say they would be less likely to support a candidate with Washington experience as said this nine years ago, while about two-in-ten (22%) now say they would view this experience positively. The share saying that this would not be a factor remains unchanged (46%). In a survey conducted in September that did not ask specifically about Washington experience, 65% of Republican and Republican-leaning registered voters said it was more important for a presidential candidate to have “new ideas and a different approach,” while just 29% valued “experience and proven record.” This marked a shift in views from March: At that time, a majority of GOP voters (57%) viewed experience as more important than new ideas and a different approach. The new survey, conducted Jan. 7-14, finds that Republicans and Democrats differ over the importance of many aspects of a hypothetical presidential candidate’s background, beyond experience as a Washington official. Among the public generally, military experience is viewed as the most appealing of the 13 traits tested. Half (50%) of the public say they would be more likely to vote for a presidential candidate who has served in the military; just 4% say they would be less likely to support such a candidate, while 45% say it would make no difference. Two-thirds of Republicans and Republican-leaning independents (67%) say they would be more likely to vote for a candidate who has served in the military, compared with just 39% of Democrats and Democratic-leaners. Few Democrats (just 5%) say they would be less likely to vote for a military veteran; most (55%) say military experience would not be a factor in their vote. This gap is about as wide as it was in the last presidential campaign. More Republicans than Democrats would negatively view a candidate who does not believe in God (65% of Republicans less likely to support vs. 41% of Democrats), had a past extramarital affair (49% vs. 32%) or is gay or lesbian (38% vs. 16%). While Republicans are more likely than Democrats to view a gay or lesbian candidate negatively, increasing shares in both parties say this would not be a factor in whom to support. Fully 77% of Democrats and 59% of Republicans say it would not matter if a candidate is gay or lesbian; in 2007, 58% and 36%, respectively, expressed this view. For most Republicans and Democrats, a presidential candidate’s education at “a prestigious university such as Harvard or Yale” would not be a factor in deciding whom to support. Fully 78% of Republicans say a candidate’s attendance at prestigious university would not matter, as do 71% of Democrats. Nonetheless, somewhat more Democrats (24%) than Republicans (14%) say they would be more likely to support such a candidate. While Democrats are far more supportive than Republicans of legalizing the use of marijuana, they have similar views of a hypothetical presidential candidate who used marijuana in the past. Large majorities of Democrats (78%) and Republicans (74%) say a candidate’s past use of marijuana would not matter. Democrats and Republicans also have about the same views of a candidate who has had personal financial troubles. Roughly four-in-ten in both parties (42%) say they would be less likely to support such a candidate, while 50% of Republicans and 48% of Democrats say this would not matter. Shiva Maniam is a former research assistant focusing on U.S. politics and policy at Pew Research Center.